From mid-July through the end of August 2004, the athletic fields and grounds of Hamden Middle School were plotted and tested for contamination by the Regional Water Authority. Under the direction of the consultant firm Leggette, Brashears & Graham, Inc. (LBG), teams of workers dug into the soil and groundwater to take soil samples and install groundwater monitoring wells. LBG will evaluate the results and come up with a recommendation of what needs to be done to complete the remediation of the school property. This information will be put into a complete report that will be submitted for the Department of Environmental Protection’s review and approval in March 2005. The report will also be shared with the public. Before any testing could begin, the consultants had to carefully plot out a huge grid using thick twine and stakes to map the entire 20-acre site. Some 60,000 feet of twine (11 miles) was needed. The testing at the school was being done to locate sources of contaminants, soil cap and edge of former landfill areas, buried drums and metal objects and to determine the flow of groundwater on the property. (Follow this link to read a summary of testing plan.) The following photos show only a few elements of the investigation at the Middle School site. 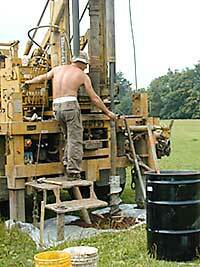 They were taken on site visits in July and August, 2004. Searching for buried drums and other metal objects in the athletic fields behind Hamden Middle School has been made a lot easier by using electromagnetic surveys. 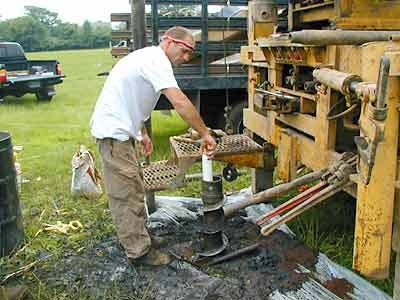 Technicians are able to detect metals at specific locations below the ground surface by using sensing devices without having to excavate the entire field. The odd-looking instrument uses electromagnetic waves (pictured above) to detect metal objects buried underground. Before the technician began her trek, the entire Hamden Middle School property had to be marked out with twine, in 20 x 20 foot sections to form a huge grid of the property. This not only made walking the property easier, it also made sure all sections were covered by the sensing device and, if metals were detected, their location could be accurately marked for further study. The electromagnetic survey showed that most of the Middle School site that had black industrial waste fill had a possibility of containing metals. So more testing in these areas using ground penetrating radar (pictured below) was necessary to try to get more detail. When readings from the ground penetrating radar device suggested there might be metals buried below, consultants dug test pits on the school property. The pits were 8 feet deep and varied in length and width. Pictured below is a test pit dug in late August at the Hamden Middle School. 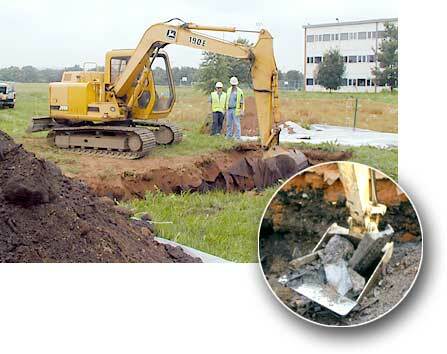 Note the safety procedures followed handling potentially contaminated soil and objects. Some objects get a closer look. Chris Harriman of Haley & Aldrich, Inc., a consultant hired by the Town of Hamden, finds paper with writing on it. 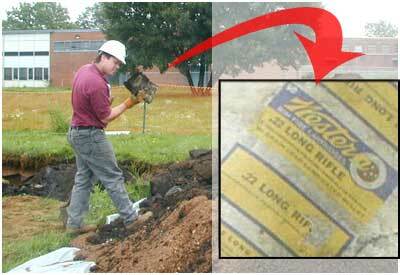 He is able to read labels for boxes made to hold .22 caliber gun ammunition made by Winchester Repeating Arms. No buried drums were found in the test pit. Objects were similar to what was uncovered from other test pits previously dug at the school, parks and in the neighborhood – bricks, bottles, scrap metal, paper, battery caps and rods, wood and concrete. 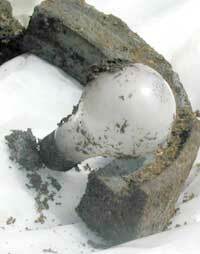 One surprising find was a General Electric 50 watt light bulb – and it was unbroken despite being buried under heavy soil so many years ago! When examination of the test pit is complete, excess contaminated soil is placed in a storage container and removed from the site. Clean fill is put into the pit to a depth of four feet. 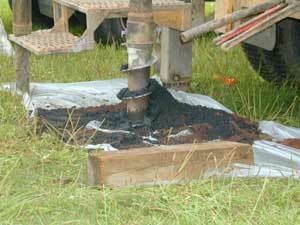 Ground where test pit is dug is covered with clean soil and normal use of the field can resume. Is the water in the ground contaminated? Water in the ground beneath the athletic fields at Hamden Middle School is not used for drinking water. But previous testing showed some traces of contamination in groundwater. So DEP wants to understand how much contamination is present and where water flows when it leaves the property to find out if there is a health risk. Monitoring wells were installed on the property in 2002 and information is gathered from these wells every three months. 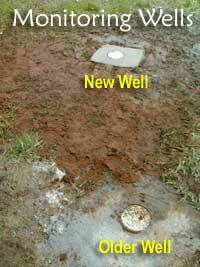 Pictured are the covers to an older well, placed to a depth of 15 feet (in front of photo) next to a newly installed well. The newer well goes to a depth of 38-42 feet and its purpose is to measure whether contamination is found deeper in the groundwater. At this well site at the Middle School the top layers of soil appear dark brown and sandy. Deeper down the soil becomes black matrix fill. This fill can have elevated levels of lead, arsenic, PAHs and petroleum by products that may have been used in the gun manufacturing process. Both the soil and black fill are seen at the base of the auger drill in the photo below. The hole for the well is dug until the native soil layer is reached. This well was placed at a depth of eighteen and a half feet. 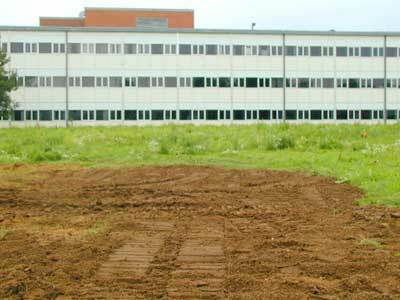 The technicians knew they had reached native soil when the soil color turned from black to a dark brown color and had a peat-like texture – the kind of soil that would be found in a wetland area as the Hamden Middle School site once was. On one hot summer day in August the fields behind Hamden Middle School were buzzing with activity by contractors facing a deadline. School would open the following week when there would be demand for using the fields. Here’s a look at what was going on that day. DEP’s Shannon Pociu was monitoring all operations. 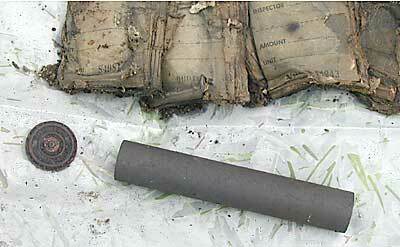 Chris Harriman of Haley & Aldrich, Inc. was observing for the Town of Hamden the kinds of objects buried on the site. Mike Manolakas of Leggette, Brashears and Graham was supervising three groups of contractors involved in three different types of testing – tests pits excavation, collecting soil samples using a Geoprobe and installing monitoring wells – at different locations on the site. Eric Boswell of Loureiro Engineering Associates, Inc., DEP’s consultant, was collecting duplicate soil samples from LBG’s staff for the DEP’s own analysis (for quality control). Equipment included: a back hoe, dump truck, roll off storage containers, hollow stem auger rig, Geoprobe and equipment for soil sampling. About 12 people were working on the site. This was only one day in the life of this project. Yet, it was a window into how much work and coordination of activities is required to do a complete and thorough job testing in the Newhall neighborhood.